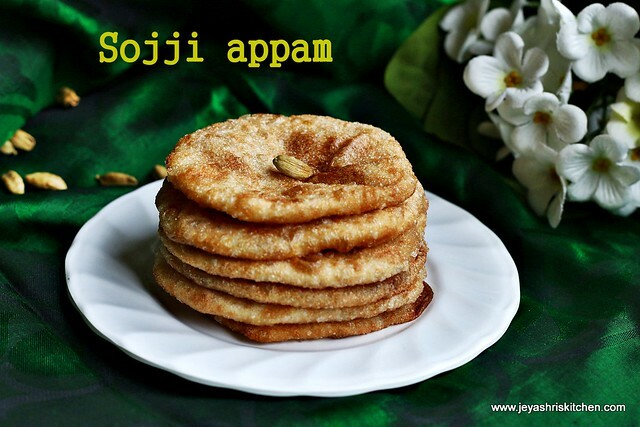 Sojji appam , is mostly made during Krishna jayanthi or the Sumangali pooja . 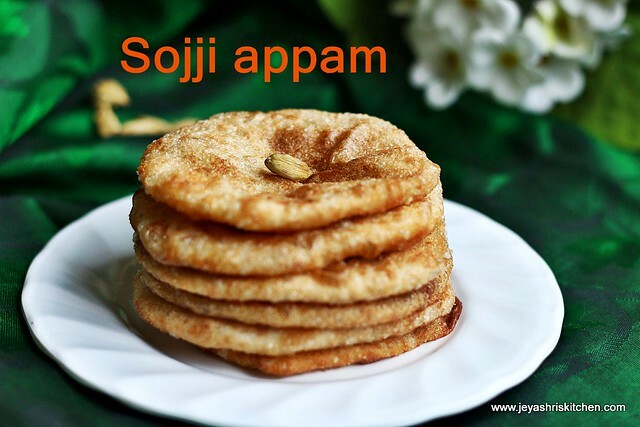 During our childhood days, whenever we visit Madurai Thiruparamkundram temple with my mama, he buys this sojji appam for us as we both love that very much. We both happily sit in the Kovil and relish this without caring about the calories. This sojji appam is highly addictive. 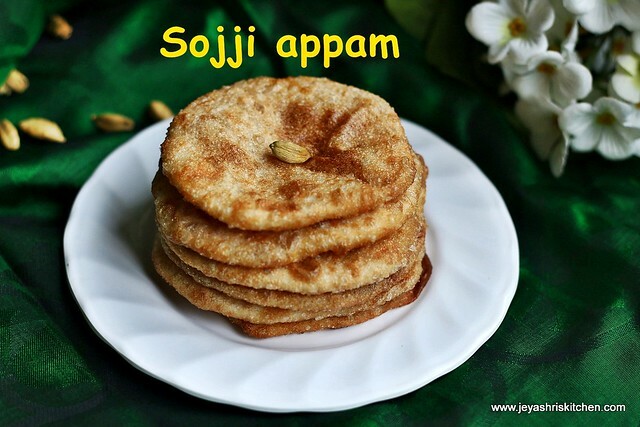 My athai makes this sojji appam very well and it is her favorite sweet too. 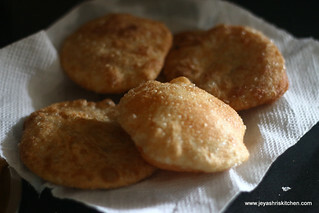 Last year itself i wanted to post this recipe of sojji appam, but somehow missed it. 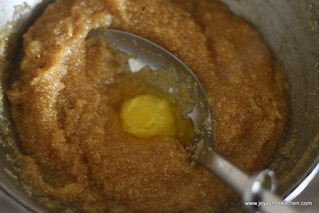 Sojji means Kesari|sooji ka halwa. The outer layer is covered by maida and inside stuffing will be with sojji. 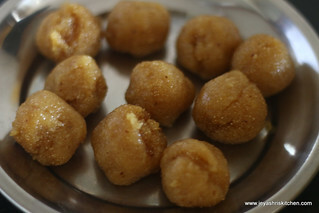 I made the sojji with jaggery, but you can make with sugar instead of jaggery. Do not add kesar colour for Kesari, if making with sugar. 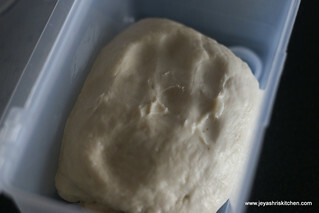 Knead the maida by adding salt into a soft pliable dough. You can add a pinch of baking soda while kneading. Add a tsp of oil to the dough and keep it covered for an hour. Meanwhile we make the stuffing for the appam. Dry roast the rava for 5 minutes in a low flame. Do not change the colour. 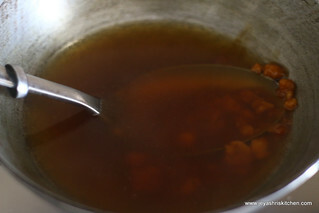 Melt the jaggery in 2 and 1/2 cups of water. Filter the impurities. 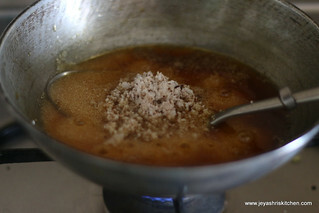 Let the jaggery comes to a rolling boil. Simmer the flame and add the sooji and grated coconut. Be careful not to get any lumps. Stir continuously. When it comes to whole mass and the rava gets cooked . Add 1/2 tsp of ghee to this. and mix well. Switch off the flame and allow this sojji to cool. 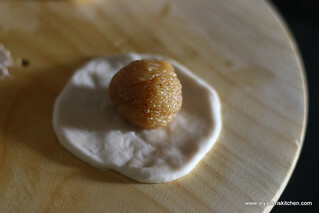 Make the dough in to equal lemon sized balls. Make the sojji also into balls. Take one dough ball. 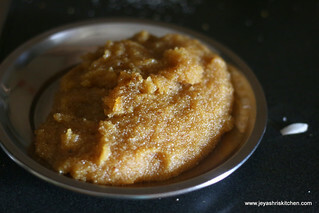 Grease your hands with ghee and flatten it with your fingers. Place one sojji ball in the center and close the it without any gap. Flatten this with the fingers. If using rolling pins, roll gently. Let this be thick. Heat the oil and when it is hot, carefully fry this in oil. Fry both sides till golden brown and drain out the excess oil in a kitchen towel. Repeat this for the rest of the dough and filling. 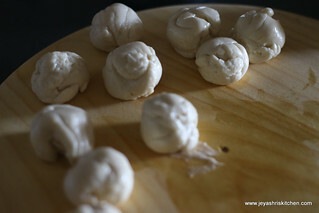 While closing the dough after keeping the sojji ball, do it carefully . 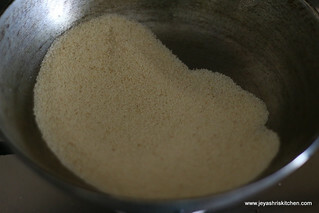 Ensure it is properly sealed, else the filling will come out while frying. 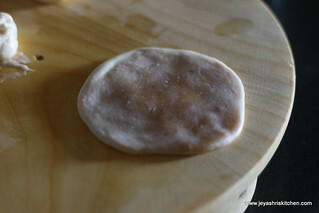 Make the appams not too thick or very thin. Fry in medium flame, too much hot oil will make the sojji not get cooked inside. If it is very low also it will not drink lot of oil and become soggy. If you do not add cococnut, this can be stored at room temperature for a day. Do not over load the oil pan, fry in batches. You can roll this and cook in a tawa like poli. So addictive. 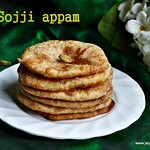 I love sojji appam, but never made it myself. I am going to try this :) Happy Gokulashtami! Beautiful appams, love to munch some. Jeyashri - very timely recipes. Inspired by you. Keep inspiring many women with your good work / recipes. I will sureoly try. I think as women, if we love cooking - that is a great way to build a family and many famillies together make a nation. May goddess Varalakshmi bless us all. Thank you so much for the feedback. To get crispy outer layer, while kneading the dough add 2 tblsp of hot ghee or oil. Also keep it aside for 30 minutes. 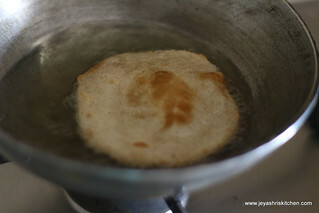 While frying cook in a medium low flame like how we do for kachori to get a crispy outer layer.